How Americans Think About Screening Tests : Shots - Health News There are conflicting guidelines on when women should get mammograms and mounting questions on when the PSA blood test for prostate cancer is worthwhile. We asked how people are sorting things out. 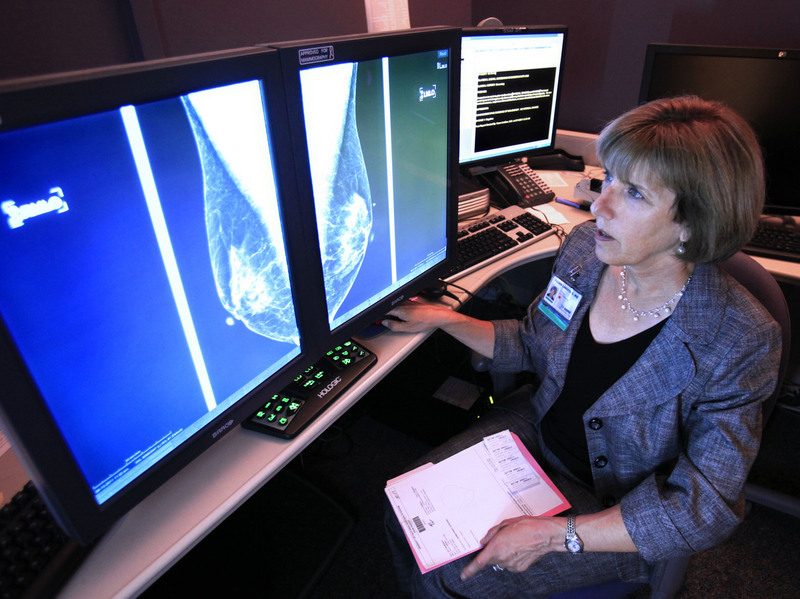 Dr. Karen Lindsfor, a radiologist at the University of California, Davis, Medical Center, reads a mammogram in Sacramento, Calif.
An ounce of prevention is worth a pound of cure, Ben Franklin wrote. But that was before he had to consider the risks and benefits of screening tests for cancers of the breast and prostate. There are conflicting guidelines on when women should get mammograms and mounting questions on when the PSA blood test for prostate cancer is worthwhile. Yes, early detection can help in many cases, but there are also false alarms and unnecessary treatments, too. So how are people doing when it comes to sorting through information about screening? We asked in the latest NPR-Truven Health Analytics Health Poll. More than three-quarters of women 40 and older said they knew about guidelines for mammograms. In that group, a little more than half said the guidelines had an influence on their decision to get tested. Among women who hadn't had mammogram in the past year, the top reasons were that they didn't have time, chose not to, or that they'd had one but just not in the past year. As for men, about two-thirds of those 50 and older said they knew about guidelines for PSA testing. But less than half of them said the guidelines had affected their decision about getting tested. How about screening for diabetes? The U.S. Preventive Services Task Force doesn't recommend routine screening of people without symptoms, unless they have high blood pressure. But we were curious and asked. About 24 percent said they'd been screened for diabetes in the last year. As for colorectal cancer screening, 14 percent of people said they'd had one in the last year. The current guidelines call for screening beginning at 50, and repeated at varying intervals depending on the test used. In general, the more education people have and the more money they make, the more likely they are to get screened, the survey showed. But there's another important factor. "If you don't have a relationship with a personal doctor, you're less likely to have appropriate screenings," Dr. Ray Fabius, chief medical officer at Truven. The nationwide telephone poll of more than 3,000 households has an overall margin of error of 1.8 percentage points. You can find the questions and full results here.